I’ve referred to my skepticism regarding “best-of-the-year” lists, and I admit I’ve started to feel something similar about New Year’s resolutions. But there’s one resolution I made a few years ago (and I think that was a reboot of an impulse from way, way back) which has begun again, quite expectedly, to fascinate me. Namely, to listen closely to a new prelude and fugue from the Well-Tempered Clavier each day before focusing on other music. Of course this is merely borrowing an idea that inspired me when I came across it in Pablo Casals’s memoirs (Joys and Sorrows, if I remember correctly). Casals got into the habit of starting each day by playing some Bach at the keyboard — I believe this was before he’d made his own epochal rediscovery of the Cello Suites. Like Casals, Tureck — the so-called “high priestess of Bach” — was a key player in reclaiming Bach for 20th-century listeners. It’s hard to imagine that when she was coming of age, Bach was still thought of by many music lovers as the music you played to get your fingers in shape and master coordination. I wish you joy of your daily exploration of the 48 Preludes and Fugues. Your observations on the B minor fugue from the first book are very much to the point, and your quotation from Schoenberg of great interest in suggesting that the fugue subject is in the twelve tone mode. Is it a coincidence, do you think, that the opening C major Prelude, also contains all twelve tones in the scale? 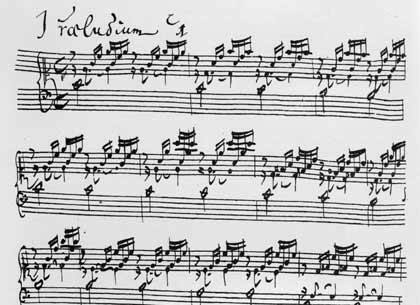 Could it have been Bach’s way of announcing that he intended to cover the full tonal gamut: and in using all twelve tones in the last fugue of the first book, of confirming that he had done so? Rosalyn Tureck was the great Bach pianist of my youth whom I heard more than once in London. In 2000, as part of their programming to mark the 250th anniversary of his death, the BBC played a recording of the whole 48 which she had done, and I remember it with great pleasure and admiration. I am surprised only by the dismal electronic instrument she was playing.